Make a Gummy Snack of Yourself. Because That's Romantic. March 14 is a special day in Japan. It's White Day. On White Day, men are supposed to give chocolates to the women who gave them chocolate on Valentine's Day. But why give chocolate when you can make a gummy version of yourself? As website Spoon & Tamago points out, Shibuya's FabCafe is doing a follow up to its Valentine's Day event during which women scanned their faces onto chocolate truffles. 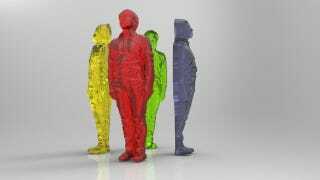 This time around, men can scan their bodies to make gummy bear versions of themselves. It costs ¥6,000 (US$64) to participate in the event. You might think that's a lot of money, but nothing quite says love like letting people chew off your head. Nothing.